Day three of the NZ Enduro began with a short and sweet Heli trip to Fosters hut at the top of the Wakamarina valley. Stage one began with a minute of un-ridden natural loamy skid line before blasting down the old gold miners trail to the creek bed. Local rider Jamie Hubbard broke his derailleur off before stage one yesterday. Knowing he had 37km to go he was keen to crack on anyway but had another nightmare on stage 2 when he crashed and snapped his handle bars. He fixed his bike last night and came hauling into day three with a big smile on his face. Keegan Wright crashed out on stage one yesterday, hurting his shoulder in the process. He took the rest of the day off but came back today and to ride the trails anyway and posted a 2nd place 10.41 on the monster stage two 16 seconds back from winner Jerome even though he said he was holding back. Charlie Murray wasn't sure whether to enter Pro or Am's before the start of the race having not done much bike racing. After a bit of convincing he entered Pro then finished 4th overall. Not a bad result for a young lad who's primary passion is Skiing. Sam Shaw has come a long way over the last few years. He battled hard all weekend to claim a hard fought 2nd place. We look forward to following his overseas escapades in the coming months. When racers arrived on the river terrace butchers flat they were treated to Granola from local legends Yum, and a coffee cart. Upon returning from the days racing they were treated to an event village packed with food, beer, a raffle raising money for Trailfund NZ and much needed shade from the blazing sun. Jerome Clementz Must be one of the greatest ever mountain bike racers. 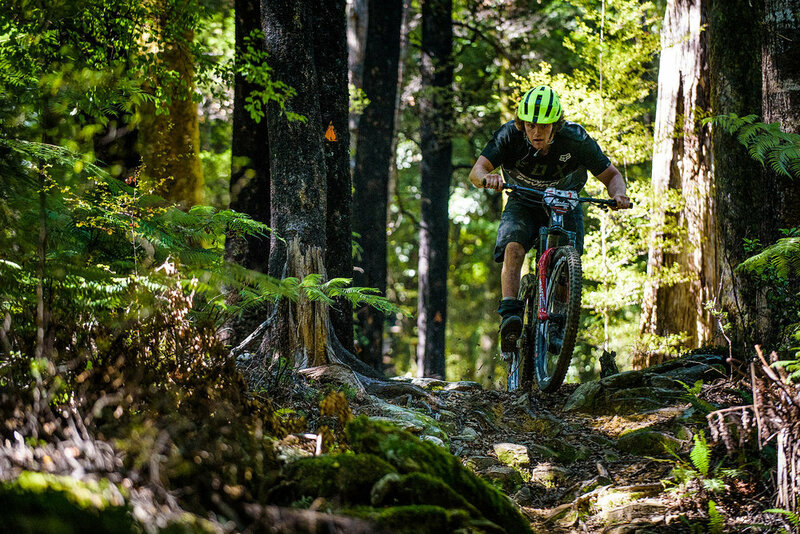 there are very few races that he has entered and never won, NZ enduro took three tries, but he got it this year, beating Sam Shaw by a commanding one minute 51 seconds. Emily Slaco has had a spectacular trip to New Zealand so far. With a win in Trans NZ 2 weeks ago followed by a 43 second win over Harriet Harper this weekend. Cheers Sven and Anka for another great edition of NZ Enduro. We look forward to returning next year for more Great trails and even better memories.